Soooo you know that “I can’t feel my face when I’m with you” song? If not… here. I didn’t love it at first, but I am 100% hooked. I’ve been non-stop dancing around my apartment with it blasting for at least the last 24 hours. My neighbors probably think I’m a total lunatic… Oh well! MAYBE I AM!! Even though I’ve been jammin’ out to it, I’m still totally unsure of exactly what it means… I mean, like he’s so in love with a girl that he can’t feel his face when he’s with her? Is that normal? Have I been missing out on face-numbing love? Frankly, I’m not sure that sounds like a healthy thing. Maybe he should get that checked out… Anyone else experienced this? Besides rocking around my apartment all day, I’ve been eating mass quantities of veggies (STILL). My mom dropped off a big batch of homegrown beets, which lasted me all of a few days (and will make an appearance on Friday! Beet gazpacho!). Along with beets, I know ZUCCHINI SEASON IS ARRIVING! Or maybe it has already? I love that point in the summer where everyone has WAY too much zucchini and is always trying to pawn it off on everyone else. I’ll take it!! I’ll make these! Or zucchini bread! 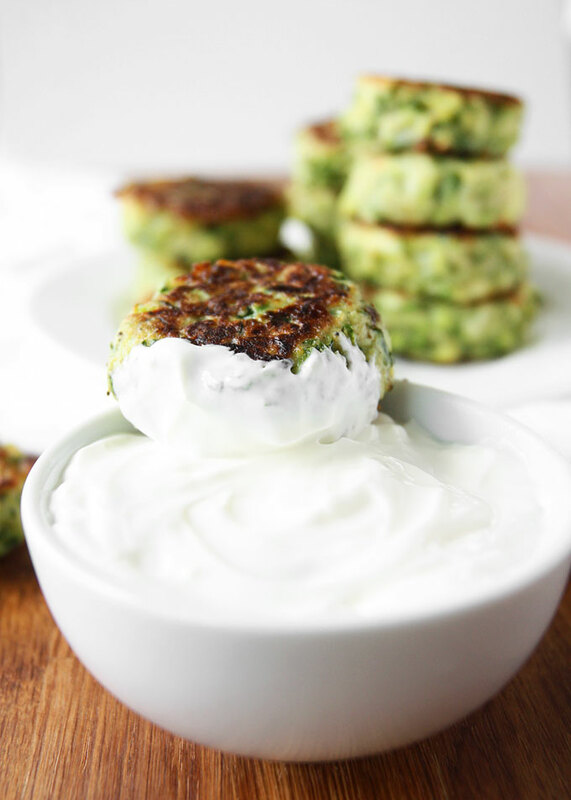 Or zucchini pancakes! Or zucchini bread FRENCH TOAST! Heck yeah, that’s on my list for this summer (GET PSYCHED!). 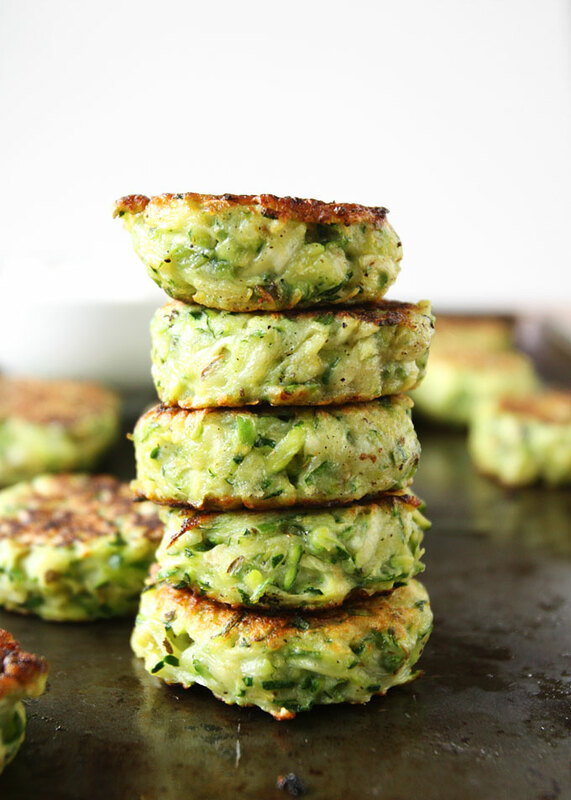 These jalapeño zucchini fritters are a very close relative to the spicy zucchini fritters I posted years ago. I was going to just re-do the pictures in that post, but I ended up changing the recipe enough that I thought it warranted it’s own thing. Instead of using dry spices, this uses a whole, fresh jalapeño! You could throw in (or omit) any pepper you want to adjust for spiciness. Even with all of the seeds, these weren’t very spicy at all — but I think it was a tame jalapeño. You know how sometimes they’re NBD and sometimes they’re like WHOA HOLY MOLY SPICY!? Yeah, this was the former. Just like the last time I made these, I had a hard time not eating them straight out of the pan! They’re so freaking tasty! And definitely better warm. Honestly, they’re not the best when they’ve cooled, so eat ’em while they’re hot! I dipped them in good ol’ sour cream. Right now, in this crazy heat we have in PDX I’d like to dip my entire body in sour cream… but I feel like that’d be expensive/gross/weird, despite how awesome it would feel. So. Damn. HOT. With a large box grater (or food processor with a shredding disk! 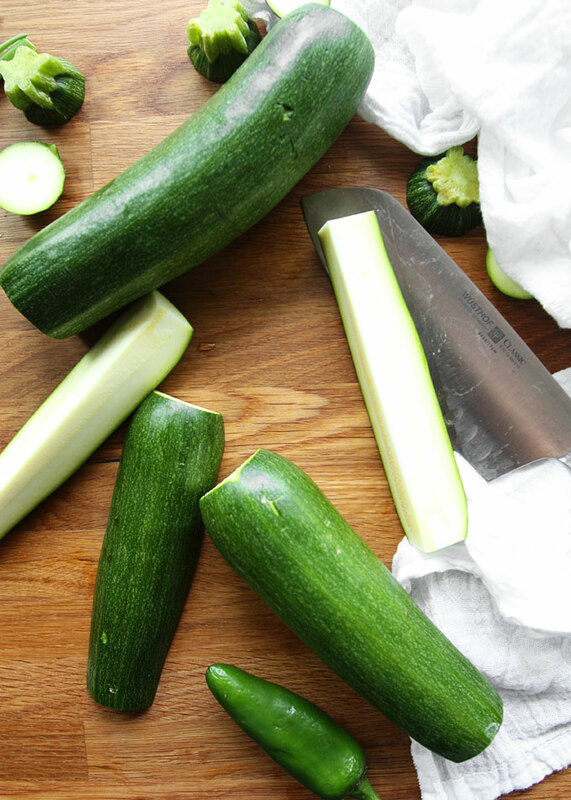 ), shred your zucchini. Toss it with 1 tsp salt and let it sit for 10 minutes. Meanwhile, either use the food processor or finely chop together the chives, jalapeño, and garlic. When the zucchini is ready, squeeze the excess liquid out of it either by wringing it in a cheese-cloth. 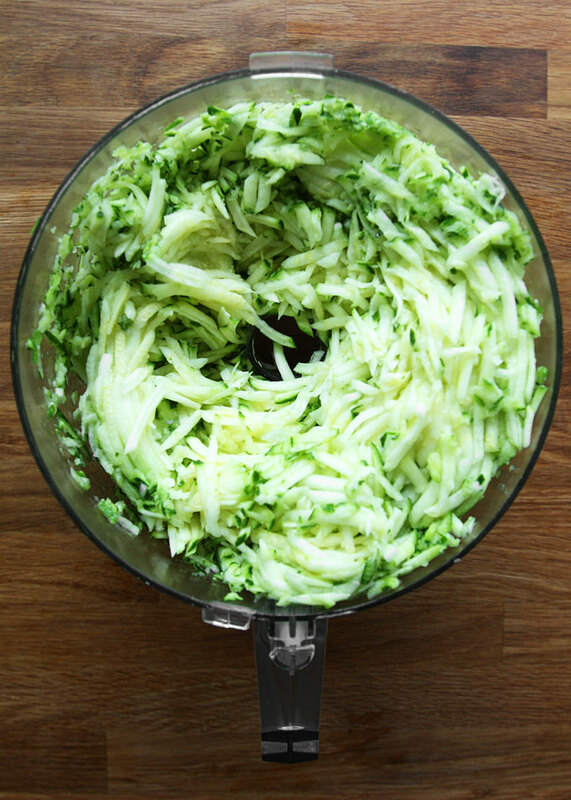 Return the deflated zucchini shreds to a medium bowl. Mix the egg and minced jalapeño/chives/garlic into the zucchini shreds, then add the dry ingredients and mix until fully incorporated. The mixture should be cohesive, not dry, but also not drippy. If you need more liquid, add milk one tsp at a time. Heat a few Tbsp of olive oil in a large skillet over medium-high heat. When the skillet is good and warmed up, drop large spoonfuls of the zucchini mixture into it. Gently flatten the fritters with the back of your spoon. Cook on each side for about 3 minutes: they should be a beautiful golden brown on each side. If this is happening too quickly, turn down the heat. Keep them warm by transferring cooked fritters to a baking sheet in your oven, heated to 200 F. Serve with sour cream, if desired. Just had some inspired by this recipe! Thank you for posting this! And good seeing a local blogger (I’m in Vancouver). Yum! Thank you so much. These are beautiful – love how plump they are! Can’t wait to try this!!!!! I used to make something similar with nutmeg (surprisingly it really adds something to it) and I loved it! Somehow the recipe got lost so I am keen to try some similar dishes! hi! 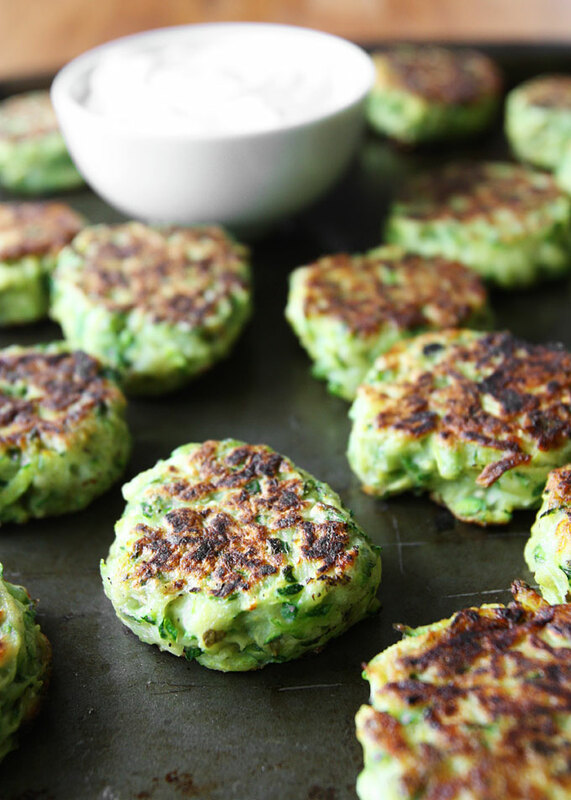 These look amazing and I am going to veganize them with a flax egg – it’s going to be amazing! THAT MAKES SO MUCH SENSE! Oh man. How did I not know that? Ha! Thanks for the enlightenment. Yep! Definitely figured that out waaaay after writing this post!